'Climate change caused by mankind' became a universal religion during the last decades. Below I explain why I am a disbeliever also in this respect. I feel honored to be invited to talk to you about climate change. Let me first apologise for my English. Several years ago I read a story to my grandson. He himself had just acquired the abillity to read. After I finished, he asked, whether this time he could read me one? He picked up a book with English fairy tales, took a deep breath and looked at me somewhat puzzled. Then he said: “Granddad, I think your English is not so good. Shall I read it to you in Dutch?” Which, to my surprise, he did! I am afraid that since that time my language skills have not much improved. Governments ponder, make bold statements and take some measures. Private businesses adjust their pr-strategy. They offer endless new products and services allowing us to reduce our CO2–emissions and so help to save the earth. Because, when ‘climate change’ is mentioned, what we really mean is: man-made, or antropogenic climate change. It is our fault! I bet, most of you are worried about the climate as well. And if you should forget your responsibillities for a moment, friends, neighbours, children, newspapers, TV or the government will immediately remind you of them. In the mean time there are thousands of scientists, world wide, who disagree with the conclusions and with a series of supposed facts presented by the IPCC. I shall show you some of the most important findings, doubts and contradictions. The IPCC informs us that the mean temperature of the earth, sea and lower atmosphere has risen 0,6 oC over the period from 1860 till now. Around 1860 the first reliable measurements of temperature were made in the UK, Holland, France and a few other places. What does the IPCC mean by 'the temperature of the earth'? If we look at just one place on earth say: the Dutch Met-office, KNMI, located in De Bilt, and we measure the daily average temperature during the period 1901 – 2008 we get the above picture. Can you imagine, what it would look like, if you added similar data for many other places on earth? Of course, you can add it all up and divide by the number of measurements and say: “this is the mean temperature”. But what is the meaning of such arithmetic? I admit, it is some kind of indicator, but only trustworthy if the measuring stations were kept constant. During the period 1860 untill now many more stations have been added to the set. How has that influenced the outcome? A number of stations meanwhile have become surrounded by buildings. The temperature in urban environments is higer than in the surrounding fields. The difference may be an odd 5 degrees C (!). Measurements were done on ships. How reliable were they? These ships measurements are being replaced by measuring buoys. Do they read the same results as the ships? The IPCC puts the blame for the current rise in temperature on man. We burn fossil fuels which produces CO2, a so called greenhouse gas. If the earth had no atmospheric gasses that absorb parts of the outgoing radiation, the green house effect, the mean temperature on earth would be 254 K ( - 19 oC) as opposed to the current mean of 288 K ( + 15 oC). This difference is not seriously contested by scientists. The atmospheric gasses responsible for this greenhouse effect are water vapour, CO2, methane and some minor contributors. Burning of fossil fuels, oil, coal and natural gas produces CO2 and that is held responsible for the observed warming up. The concentration of CO2 in the atmosphere – presently about 380 ppM - is indeed rising. There is no doubt about that. The IPCC caught the world’s attention by showing a sudden temperature change as a function of time, known as the hocky stick curve. It was displayed in early IPCC reports untill it was finally omitted in the 4th report in 2007. The inventor, Mann, obtained temperature data of earlier times from measurements of the growth rings of trees. The graph came as a shock to the world. The picture suggests strongly that at the moment mankind began to seriously consume fossil fuels, the temperature on Earth started to rise dramatically. The black line is Mann’s original graph. 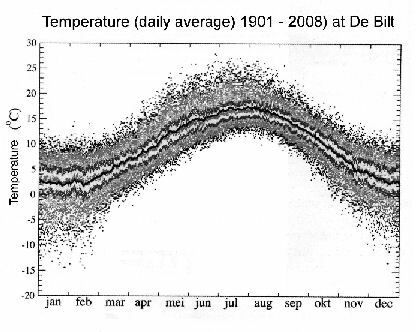 The red line are instrumental data in the years in which direct temperature recordings existed. They confirm Mann’s tree data. However, shortly after Mann published his findings, McIntyre and McKitrick checked Mann’s sampling technique and his statistical method. They found serious faults with both. Did this shake up the climate alarmists? Not at all! Mann refused to disclose his original data and the two critics encountered serious difficulties in getting their work published. Journal editors believed in the infallibility of the hockystick2. The IPCC repeated Mann’s graph in subsequent reports. But in science ultimately the truth prevails. The mistakes became known nevertheless and the believers had to step back. McIntyre and McKitrick’s results are drawn in green. They show the higher temperatures in the Middle Ages – well known from historical sources, like wine production in the UK and The Netherlands for instance, or green Greenland explored by the Vikings. They also show the so called ‘Little Ice Age’ (LIA) around 1700, known from Dutch paintings among else. Last year there was an interesting confirmation from the seabed near California were diatoms showed a co-occurence of the LIA, out there in the same period. It blew away the argument cherished by the alarmists: that the LIA was only a regional European anomaly. The corrected graph shows that present day temperatures are by no means as exceptional as the climate change adepts made us believe. In fact temperatures in the Middle Ages were higher than they are now. What one sees here are a series of ice ages followed by brief ‘inter glacials’. We live in the last of them since about 15000 years. Note that in the distant past there were no humans who burned fossil fuels. There is another thing that sets serious doubts about the hypothesis of man made global warming. Not only are the temperature ranges on a geological scale much greater than the temperature change we are discussing (12 – 15 oC against 0,6 oC now) but also, if one takes a closer look at the time resolution, we see that in the past, temperature rise and fall preceded the rise and fall of the CO2–concentration! This fact is consistently overlooked or left out by the environmentalists and the IPCC-lobby. It seems that the rise of temperature triggers an increase in the concentration of greenhouse gasses. There is a simple physical explanation for this observation. The solid and liquid surface of the earth and its CO2-content is in chemical equilibrium with the atmosphere. If you put more CO2 into the atmosphere, the equilibrium is disturbed and the liquid and solid earth absorb so much of the gas till a new equilibrium at slightly higher concentrations is reached. One should keep in mind, that the mass of the atmosphere is small. It amounts to 1 kg above every square cm of the earth’s surface. If you look at the oceans, about 2/3 of the Earth's surface, you only need 10 m of water to have the same mass. So solution in the oceans of a few more ppM of CO2 is not a big deal. (Apart from that, plants grow faster and so absorb more atmospheric CO2 at higher concentrations.) The chemical equilibrium between CO2 in the gas phase and CO2 in solution in water shifts if one changes the temperature. Higher temperatures mean less solubillity in water. So, with increasing temperature the oceans give away part of their CO2 contents to the atmosphere. In the past this is, what has happened. That is why in the 400 000 year graph the greenhouse gasses oscilate with temperature – but in fact with a little time difference, temperature change comes first! If the temperature on Earth regulates the amount of CO2 in the atmosphere, does that mean that CO2 has no effect on temperature at all? The answer is: certainly not; it does have an effect. In the beginning I told you that without the greenhouse shield temperatures on earth would be about 34 oC lower than they are now. Of this difference, we estimate that about 9 oC can be attributed to CO2. However, that does not mean, that if one doubles the amount of CO2, the temperature increases with another 9 degrees. In fact it has been shown by Nir Shaviv (Israel) that doubling of the concentration would raise the earth’s temperature by a mere 1,2 oC. It is in fact a logarithmic function. This means, that for every 1,2 degree of temperature increase one needs to double the amount of CO2. This is the case in the concentration range with which we deal. So our greenhouse gas gives a positive feed back to the heating process, but that does not mean that it determines the temperature. If that were the case in earlier interglacials the temperature would have continued to rise and by now we would all be boiling. Let us have a closer look at atmospheric CO2. There is about 750 Gton (gigaton) of it in our air. Each year nature puts in about 150 Gton and at the same time takes out about the same amount. The slide shows the sources of CO2–input. Burning of fossil fuel adds about 4% to the input. Flying insects, by the way, put in about ten times more than mankind with all its machines. What happens to the about 6 Gton we bring into the atmosphere? I told you already, that the amount of CO2 in the atmosphere increases. The increase is about 3 Gton. So half of what we add is already absorbed by earth and oceans in the same year. If we compare the actual – measured – CO2-increase in the atmosphere with the predictions of the IPCC, we see an interesting discrepancy. It is just one of many such discrepancies. The IPCC uses so called climate models, computer simulations of the processes influencing the climate. Time and again they have had to change the parameters steering those simulations in order to fit the outcomes with the measured data. As I said before, the chemical equilibrium between air, soil and oceans ultimately rules the concentration in the air. The relative tiny bit which we add might even disappear almost completely if we would wait a little longer. The relaxation time, that is the time necessary to reach equilibrium, is longer than a year; probably around 10 – 20 years. Therefore I expect the growth curve to level off, contrary to the bending upward in the IPCC models. If the slope of the line would remain constant as it looks from the measurements and if the increase would be our doing and not due to an equilibrium shift from other natural causes, it would take > 200 years for us to double the atmosferic CO2-content, and thus to raise the temperature by 1,2 oC. Why is the IPCC then so alarmed? And why do they warn for a temperature rise of some 5 oC? The relevant atmospheric processes are poorly understood. The IPCC assumes that the increase in temperature will cause an increase in other greenhouse gasses. A warmer earth will evaporate more water. Thus more water vapour in the atmosphere, causing more warming up etc. Another assumed positive feed back. But more water vapour means also more clouds. And clouds reflect the incoming sunlight before it can heat up the earth. So there are arguments as well, to predict a cooling effect! The previous interglacials in which the CO2-concentration also became high, were not extended by this feed back phenomenon. Why would it occur now? As I said before, the climate models have no realistic physical basis especially when the role of water is considered. Heat transport from the equator to the poles, heat transport by evaporation and condensation, adiabatic atmospheric processes and major regulating effects except those of radiation are all neglected. The models are highly speculative. I think it unwise and certainly unnecessary for governments to base their policies on such inadequate computer games. Let us have a look using a magnifying glass at the temperature again. During the period 1981 – present there is a steady increase in temperature. The trend is 1,5 oC per century. The expectations of the IPCC are more dramatic. They predicted 2,4 – 5,3 degrees increase in the same period. The measurements show lower temperatures than that. The funniest part, however, is that in the last 9 years we have seen a decrease in global temperatures. In this graph we have left out the El Niño peak of 1998, as that is clearly a singularity, a unique event, which has little connection with the processes we are discussing here. But even without that we see a downward in stead of an upward trend with temperatures significantly below those predicted by the UN climate panel. Looking at this picture, I suggest, if you do own a fur coat, don’t throw it away. Your grandchildren might need it. A major and fundamental blow to the IPCC hypothesis of a warming earth caused by an increased greenhouse effect, came recently from satelite measurements. Remember, IPCC supposes: more greenhouse gas absorbs more outgoing radiation from the earth and keeps more warmth in the system. The subsequent models used by the panel and by some independent modellers invariably showed a diminishing amount of long wave radiation leaving the earth towards outer space. The picture setts off scatter-plots of net flux of outgoing long-wave radiation. The upper left panel shows the measured values of the satellites of the Earth Radiation Budget Experiment over a 15-year period. The others are graphs as predicted by 11 of the computer models relied upon by the UN (and others). All against anomalies in global mean sea surface temperature over the period. The mismatch between reality and prediction is entirely clear. It is this astonishing graph that provides, I think, final evidence that the UN has absurdly exaggerated the effect not only of CO2 but of all greenhouse gasses on global mean surface temperature. If we have time at the end, I shall propose a possible new explanation for the temperature changes we know about. There is growing evidence that the variations are due to solar processes. But let me first deal quickly with some scary consequences of global warming against which the IPCC rings the alarm bell. The IPCC and mr. Al Gore warn us, that the sea will rise. The latter predicts 6 – 7 m during this century. This would be a disaster for The Netherlands, of which now already 40% lay below sea level. But also the inhabitants of London would be wise to move, or to have a life boat somewhere in the attic. In 2001 the IPCC prophesised for this century a rise between 9 and 88 cm. In 2007 it had narrowed the range to 18 – 38 cm if the world would seriously reduce its CO2–production; or 26 – 59 cm if the greenhouse gas emission is not reduced. The Netherlands Meteorological Office warns, that if the ice on Greenland would melt, the rise could be between 1,5 and 3 m! And if also the ice on Antarctica would melt, they join Al Gore and predict 7 m.
Let us take a look at the world before man started to interfere. Here is a graph taken from the geology textbook of Kroonenberg. 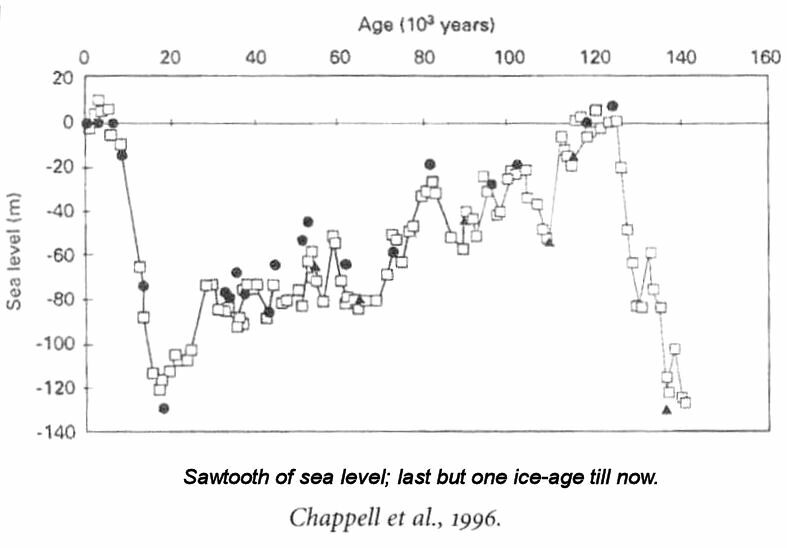 During the last ice age, some 15000 years ago the sea level was about 120 m below today’s. 10 000 years ago people lived on the Dogger Bank in the midle of the North Sea. The British did not need a ferry, if they wanted to visit the continent. They lived on the continent! One could walk from the place of present day London to that of Amsterdam. As you see in the aftermath the sea rose steeply sometimes with 1,5 m/century to its present day level. The geological data have been refined by combining different methods. Funnily enough, in an accompanying note, Waterstaat states, that it ‘regrets not to be able to confirm a faster rise of the sea level. It remains a steady 18 cm/century.’ I present their data with confidence. These are the facts. No need to start a new crash dike building program. With the present maintenance routine we can easily stay ahead of the developments. For the dwellers of atols in the Pacific there is also good news, see the next slide. No reasons for panic as you see. In the beginning of the measurements there is some turbulence. It is normal for new measuring sites. People have to fix and adjust the instruments. They have to learn how to use them. But after the human learning curve the sea becomes stable (!). The situation in the Arctic region also does not show appreciable changes. In 2007 and 2008 at the end of the summer the area had diminished compared to previous years. It reached its lowest size in 30 years; but a few months later everything was back within the normal range. The only remarkable thing was, that the downward fluctuations received wide press coverage, while the fact that at the very same moment the area of Antarctic sea ice reached a 30 year high was neglected by the public news media. Consequently people become worried. A few months later the situation in the Arctic returned to its normal state, which was barely reported either. As you see, this year, 2009, the red line, the arctic is back to its 30 year average. The shortening of glaciers in the Northern hemisphere is an uncontested truth. But it does not hold for the Southern hemisphere. Glaciers in New Zealand, for instance, are growing. 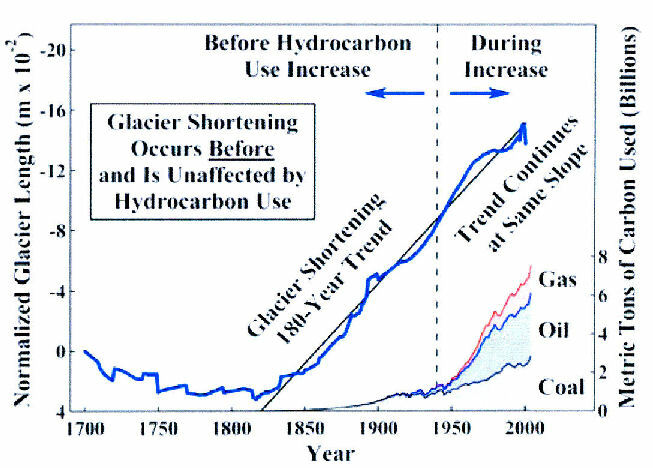 Also interesting is the fact that the shortening of the glaciers began and was well underway before mankind started to feed extra CO2 into the atmosphere! When we did that, the shortening of the glaciers continued with the same rate. Was there no heating effect? To be honest, we do not know. Glacier length is not determined by temperature alone. Precipitation is also important and as yet we do not have data to tell us whether the mountains have become dryer than before or not. There is no scientific proof of antropogenic heating. CO2-emissions do not contribute significantly to the earth’s temperature change. Sea level rises gently, as it has done the last century; long term observations only indicate this phenomenon to level off. There is no reason for costly, draconic governmental action. If my arguments have not convinced you right away, that I am right and the man-induced-climate-change people are wrong, I hope at least, that I have not bored you and that I have given you some facts and thoughts that you may consider worthwhile. Thank you for your patience3. For quite some time scientists could not explain why in relative short periods the temperatures on earth went through appreciable changes. The mechanism of the ice ages and the interglacials is rather well understood. They are ruled by the change in elepticity of the earth’s orbit, the Milankowitch cycle, with some influence of the precession of the earth axis. The effect thereof are longer summers and shorter winters during interglacials and the reverse during ice periods. But how could, for a century or so during the Middle Ages, the temperature rise by several degrees? 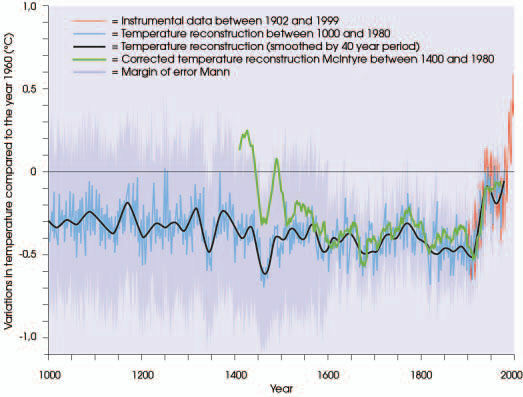 And how could a rapid cooling occur during the ‘Little ice age’ around 1700 with subsequent warming up till now? We have no clue about the sun radiating more or less heat. In fact the sun is a very stable heat source whose fluctuations are so small, that they cannot be the cause of these effects. We knew about ‘sunspots’ that occur both, irregularly and at regular intervals. This peculiar solar activity seems to correlate with mentioned warm and cool periods. However, very precise measurements have shown that sunspots do not affect the radiation flux of the sun enough to explain such phenomena on earth. During the last few months, sunspot activity has been appreciably lower than in the last decades of the 20th century. Presently the activity is nihil. That means: less magnetic shielding → more cosmic rays → more clouds → less incoming sunlight → cooling. The significance of Svensmark’s results is considerable. His work establishes that small changes in solar irradiance reaching the earth, persisting over time, can cause substantial changes in global mean surface temperature. The UN had assumed the Sun’s influence was negligible. The UN, it seems, was wrong. If this new theory proves to be correct, the leaders of the 8 biggest industrial countries, who ordered: “The earth must not heat up more than 2 degrees.” will have to command the sun to behave better. That is, if they want their statement to be effective. In “My Fair Lady” Eliza Doolittle sang:. “’Urricanes ’ardly hever ’appen”. She was a smart girl. Hurricanes, typhoons, and other tropical cyclones have declined recently, in contrast to what some climate change advocates preach. Source: Ryan Maue, July 2009. As you see, there is no reason for alarm. There is no indication that the hurricane pattern has changed during the last decades. Paper presented to the Ladies Association, Basildon, UK, 2009 09 29. Plus some additional comments made during the subsequent discussion. Mann refused to disclose his original data to McIntyre for about a decade. The data finally became public in 2008 (!). Briffa was forced by the Royal Society to show them, when he published	his research in the 'Philosophical Transactions'. 12 Ill chosen trees, that shook the world! I humbly acknowledge the help of my daughter, Djamila, for correcting some of my most obvious language mistakes. She did not consider my apology in the introduction, where I feathered my grandson, sufficient.